Kerala Weddings – Simple and short. Kerala is believed to be the abode of Gods, due to its beautiful landscape and its gentle traditions. The population consists of Christians, Hindus and Muslims, and each community has its own traditions and rituals with regards to their wedding ceremonies. The Malayalee Nair’s form the largest community in Kerala, and their wedding rituals and rites are very similar to those practiced by Hindus all over the country, with a few unique aspects, mirroring their traditions and beliefs. The Kerala Hindu weddings are amongst the simplest in the country. There are a few pre-wedding festivities which consist of dancing and singing, but the actual ceremony is performed simply without too much pomp and show. Most marriages are arranged between parents, the boy and girl meet each other at the Peenu Kanal, only after their horoscopes have been matched. The exchange of rings has only recently become a part of this occasion, earlier an exchange of letters was enough to formalize the engagement. The wedding ceremony is generally held at the temple or at a large banquet hall if it is likely to be a large gathering. 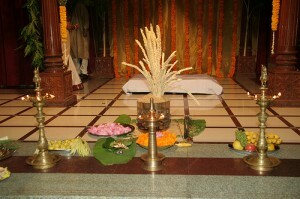 The ritual begins with the Dakshina or the presentation of gifts to the elders in the family by the bride and the groom. The bride and the groom are led to the raised stage where the wedding is to be held, by young girls carrying trays filled with a small lamp and other symbolic articles. The tying of the “thali” – a yellow string with a pendant – around the bride’s neck by the groom, signifies the culmination of the marriage ceremony. Many years earlier, the groom would arrive at the bride’s home with a few of his family members, and would gift her Pudava – the traditional Kerala dress – in front of her relatives. This simple ritual would pronounce them man and wife. You were reading about Kerala Weddings posted in Weddings and tagged Indian weddings, Kerala boys, Kerala brides, Kerala girls, Kerala grooms, Kerala marriages, Kerala matrimonials, Kerala weddings, Wedding ceremonies, wedding rituals by mridula. Bookmark the permalink.